The changes will take place as a trial from the quarter-final stage this season. The FA Cup is to trial a fourth substitute this season. TEAMS THAT REACH this season’s FA Cup quarter-finals and beyond will be able to introduce a fourth substitute if the game goes to extra-time. In a trial for the 2016-17 competition, the FA are following the system that was used in this summer’s Copa America. The trial will only apply at the quarter-final, semi-final and final stage but means that clubs who have used three substitutes in normal time can make an additional change should the game go beyond the 90. The new innovation follows the FA’s move to get rid of replays from the quarter-finals and the organisation say they’ve made the move in a bid to retain the FA Cup’s status. “The Emirates FA Cup is renowned for its great history and tradition but, as the game’s governing body, it is important The FA continues to look at how it can further add to the drama and spectacle of a competition loved by millions around the world,” said FA chief executive Martin Glenn. Email “Good news for fans of time-wasting as the FA Cup is about to introduce a fourth substitute”. 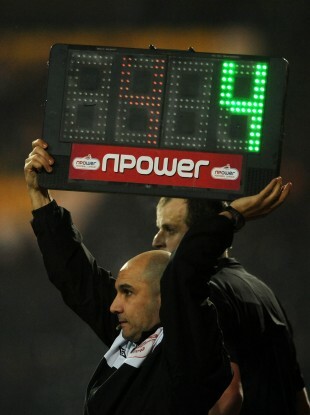 Feedback on “Good news for fans of time-wasting as the FA Cup is about to introduce a fourth substitute”.